There is no denying that the modern academic pursuit requires a LOT of chair time, most likely while next to or staring at a computer, possibly while surrounded with less-than-comfortable institutional furniture, and that this kind of work environment is pretty unnatural. Many of us work in less than ideal spaces during graduate school (I’m writing this while sitting on a couch made in a PRISON), so all too often we end up sitting and moving in ways that unduly strain, and even injure, our bodies over time. All this brings the question of how to keep your degree from destroying your body while working long hours both at your desk and at the bench. I cannot say this enough, but watch your posture! Whenever you are sitting take a moment to make sure that you are sitting upright (whether it be slightly forward, backward, or straight up) with your shoulders squared and relaxed, not up by your ears or rolled forward into that all-too-common spinal question-mark position. Once you’re sitting straight make sure that your chair is at the right height for your feet to sit flat on the floor (shorter people like me might need a foot rest). Keep your wrists neutral while using your mouse or keyboard. Think about a wrist rest if you need it—these can help prevent strain and injury from hours of typing. Also, try not to use the risers on the back of the keyboard, the increased angle can lead to strain while typing. Find a spot where the keyboard sits so that your upper arms are straight up and down and your elbows are at a 90-110 degree angle when you type. Keep the top of your computer monitor near to slightly below eye level and 20-40 inches from your face (after you settle into your chair with good posture). Too far away or too close can lead to eye strain, especially if you spend a good deal of time working with your computer. Don’t forget the 20-20-20 rule either: For every 20 minutes spent looking at your screen, stop and look at something 20 feet away for 20 seconds. This can help reduce eye-strain. Take microbreaks. These tiny breaks are a good way to prevent sitting for too long. Try different strategies to encourage microbreaks like moving your printer away so that you have to get up to grab items. These breaks also provide good opportunities to stretch out any spots that might be bothering you (more on that below). Lighting! While easy to overlook, don’t forget aboutthe lights in your workspace. Too much or too little light can lead to eye fatigue over time, so take a moment to evaluate the light sources in your workspace. Things as simple as moving your monitor so that it is not in front of a light source like a window (or using curtains) can help with contrast issues, while using a small lamp can help when reading papers, since reading hardcopy takes more light than reading on a monitor. Limit time spent pipetting to minimize strain on your handsand wrists. Make the most of multi-channel pipettors whenever you can; they save a significant amount of time and work. Can you sit at the bench? Is there a tall enough chair or will you be standing? If standing, don’t forget about comfortable shoes. There’s a reason researchers are not known for stylish shoes—they’re just not practical if you’re putting in serious hours standing. Optimize what you can about your bench. Keep your most common tools (pipettor, waste jars, tube racks, etc.) within an arm’s reach whenever possible. Here is a great resource that presents an ergonomic checklist for lab workers that can be especially helpful for people entering an unfamiliar lab environment. Stretching helps to counteract all the unnatural hours spent sitting while writing a thesis, no matter how fancy the workspace. Taking the time to periodically stretch at your desk can help alleviate some of the strain that results from sitting or standing for long periods. You don’t have to aim for yoga-master status, a few basic stretches for your shoulders and arms can go a long way in keeping you healthy. Remember, ergonomics always comes back to mindfulness. Unless you are aware of your own body you won’t know when you are hunching over, squinting at your screen, or straining your wrists from typing. Despite the common academic stereotype, we are not brains on sticks and need to treat our bodies with respect. It isn’t necessary to work standing up full-time either. Even moving your laptop to a higher surface to work for 30 minutes every day can help you feel better in the long run. 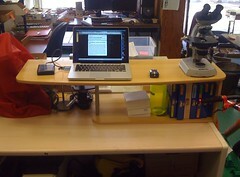 Try having two work spaces at different heights so that you can alternate between them when one becomes uncomfortable. In conclusion: These tips may all seem like relatively simple things to do, and that is the exact point. Too often it seems like you need a fancy new gadget or expensive desk chair to improve your work space and that is not the case at all. Most of these tricks are free and can be used in whatever kind of place you find yourself working, so go forth and get your degree without it ruining your body in the process. For an in-depth guide on how to ergonomically optimize your personal workspace, take a look at this comprehensive guide on how to make your computer workstation fit you. Are there any other tricks that you have found to minimize thesis-writing related strains and injuries? Share them in the comments below!